There are two ways that water enters North Beach Park. The main way, which lasts all year long, is by numerous, broad, horizontal groundwater seeps. Most of these come into the park from the south wall of the ravine; some enter the park from the base of the 24th Ave. slope. These provide a steady flow that has lasted through record droughts. The seeps move very slowly, and do not form channels. The other way water enters the park is through flashy events triggered by rainstorms. 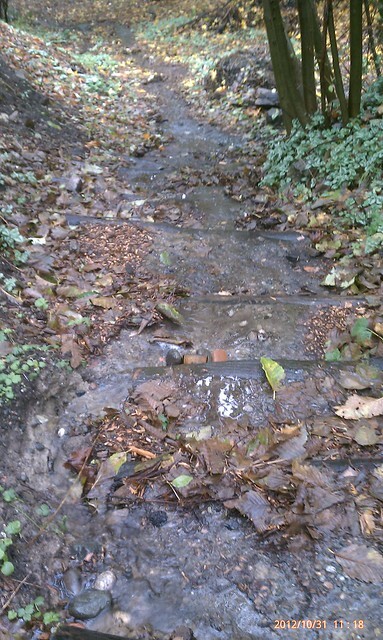 We’re still investigating these water flows. This water enters the park from two locations, the South Plateau and a culvert from 24th Ave. located at the southeast corner of the park. The first we knew of is the water flow from the South Plateau. The water accumulates for several blocks before it enters the park; by then, it is a narrow, fast flowing stream. Before the South Plateau was cleared, this water hit a dense mat that was a mixture of blackberry and English ivy. It might be that this dense mat dissipated the energy enough to avoid channelizing and erosion. In the summer of 2012, volunteers cleared the South Plateau in a series of weekly work parties. They also installed a stairway, hoping to create a native plant demonstration garden. 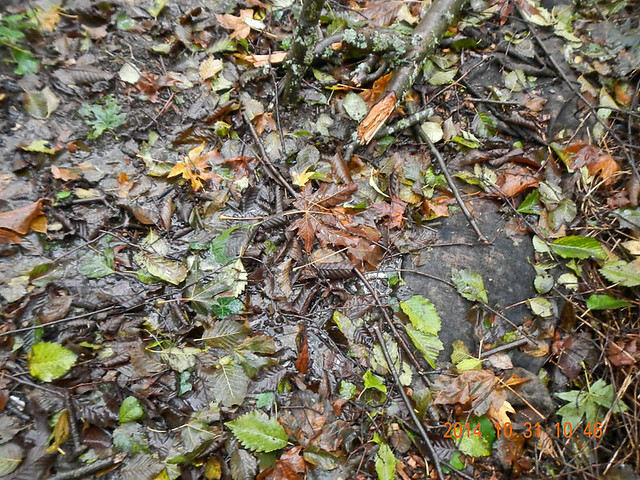 The stairway was at the very point that the street runoff entered the park. When we found out how much water was flowing into the park, the project was abandoned and the South Plateau was neglected by forest stewards until the summer of 2014. 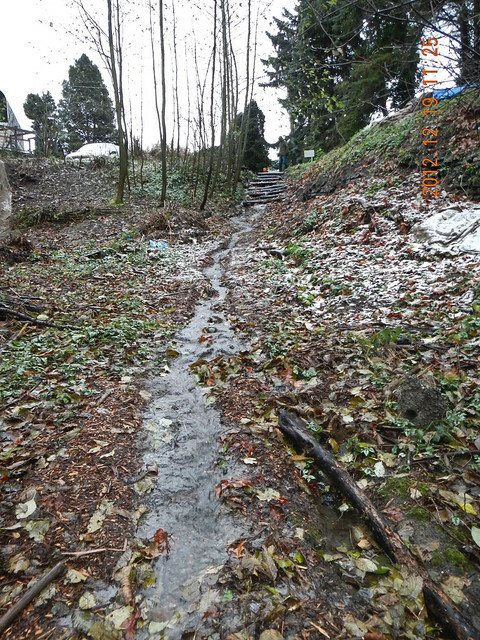 The photo above is from October, 2012, and shows the runoff sheeting over the steps. The photo above is from December, 2012. You can see how straight the channel is already. There had been little planting so far, and no attempt had yet been made to control or slow the water. In the spring and summer of 2013, Parks Department crews installed rip rap at the entrance to the park. They dismantled the staircase and replaced it with a series of coir logs forming terraces. Past the rip rap and the coir log terraces, the crews installed meanders and fascines into the channel, to slow the water down and give it more opportunity to percolate into the soil. On October 31, 2014, two forest stewards (Luke and Tad) visited the South Plateau at the tail end of a rain storm. It had rained nearly 1 3/4″ in the previous 36 hours according to a rain gauge in Tad’s back yard. This part of the post incorporates Tad’s notes from our visit. The above picture shows the flow as the rain was tapering off. The flow is much slower for various obstructions and meanders, but does not stay on the plateau long enough to sink in. At the west end of the plateau, the water runs underneath some wattles the three of us installed in May. It flows down to the main body of the park. 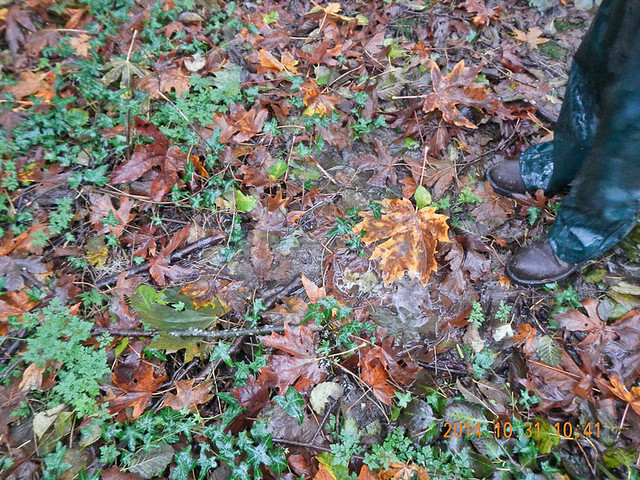 We still need to observe the runoff in the main body of the park during a heavy rain. 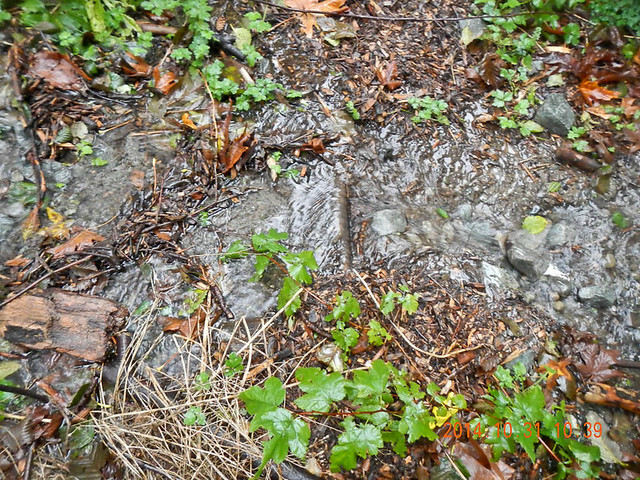 We also saw standing water or slowly moving water in many places in the South Plateau that were relatively far from the street runoff channel. Is there a clay layer near the surface? Is there something else that prevents water from percolating into the soil? We still need to explore the South Plateau and North Beach Park during heavy rain. There are a couple places where we might be able to divert the street runoff to flow over the plateau and sink in before flowing over the edge. We also need to understand where the pooling water is coming from: Another runoff we don’t know about yet, or just rainfall?